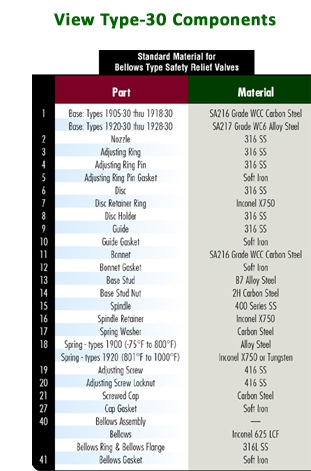 Gaskins Co., Inc. Quick Comparison Chart | Gaskins Co., Inc. The CONSOLIDATED 2900 PV pop action non-flowing pilot provides excellent performance with full lift at set pressure with minimal blowdown. Stainless steel pilot with carbon steel main base with stainless steel trim. Complete stainless steel main valve and other exotic materials are available. full lift at set pressure with minimal blowdown. contribute to the overall efficiency and profitability of plant operations. 114 sq. in. to 201 sq. in. Carbon steel body with stainless steel trim. chemical, petrochemical, refinery, power generation (nuclear and conventional) and other commercial applications. NOTE: Colors in the bars above the valves are consistent with tabs throughout this website. The 19000 Series valves are designed and manufactured in compliance with ASME B & PVC, Section VIII and Section III (Class I, II and III) as well as being CEN compliant to the European proposed standards for safety valves. Seat tightness, blowdown and capacity on all types of media meets the industry needs for overpressure protection in chemical, petrochemical, refinery, power generation (nuclear and conventional) and other commercial applications. 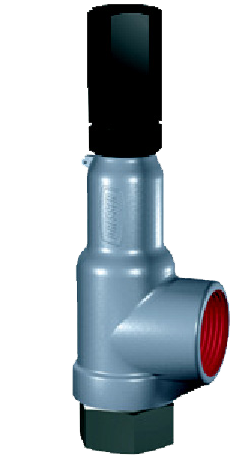 The 19000 Series threaded safety relief valve has 316 stainless steel trim as standard material. 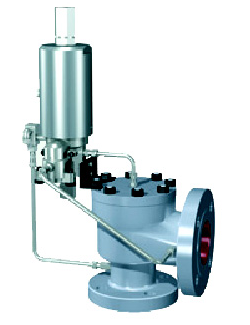 Reliable performance and easy maintenance procedures are characteristics of this valve (when properly installed in suitable applications for its design). 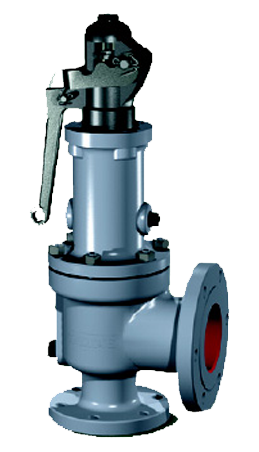 The 19000 Series valves has three pressure classes, 19000L (5 through 290 psig), 19000M (291 through 2000 psig), and 19000H (2001 psig and up). Standard 19000 parts are used for both liquid applications and gas applications. It is designed for short blowdown on all medias, typically less than 10%. All 19000 Series valves have fixed blowdown. This means that the parts are designed so that there is no blowdown adjustment required when setting or testing the valve. a. 0-Ring seat seal valves All 19000 Series valves are available with an 0-Ring seat seal, as a design option. This optional design provides a bubble tightness in excess of 97% of the valve set pressure, in order to meet application requirements beyond the normal capabilities of metal to metal seat valves. 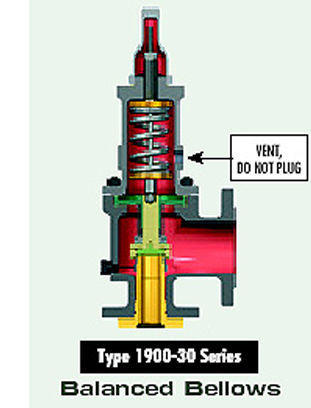 19000 Series valves with the 0-Ring seat seal option are identified by the suffix DA (e.g., 1-19096L-DA). b. Lifting Levers, Caps and Gags All 19000 Series valves are designed so that field conversion from the standard screwed cap to a plain lifting lever cap, or to a packed lifting lever cap (or vice versa) does not require valve assembly during resetting. The lifting lever option is designed to open the valve at 75% of the valve set pressure, in compliance with ASME B & PVC, Section VIII. Further, all available 19000 Series valve caps may be equipped with a gag, upon customer request. 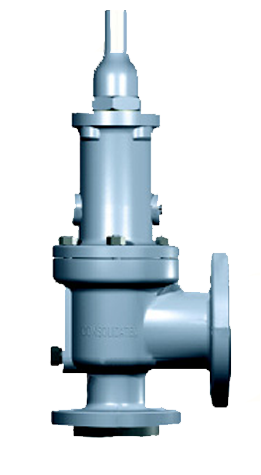 c. Inlet/Outlet Connections All 19000 Series valves can be provided by CONSOLIDATED with flanges, threaded or socket weld inlet/outlet connections upon customer request. This product is normally supplied with threaded inlet and outlet connections. Socket weld or flanged end connections are available as well. Product type designations change depending on connection sizes, orifice sizes, pressure range, and whether connections are male or female. Unless otherwise specified, the valve is always supplied with a screwed cap. The exception to this would be where ASME requires levers for steam, air and water service over 140°F (60°C). Springs of precipitation hardened stainless steel are specified for -75°F to 800°F (-59°C to 426.6°C) and the valves carry a “c” suffix in that case. Inconel springs are used for temperatures 801 °F to 1100°F (427.2°C to 593.3°C) and the valve carries a “t” suffix. When selecting valves for back pressure applications, the following limits apply. Variable back pressure (superimposed or built-up): 400 psig or 10% of set pressure, whichever is smaller. The 1900 Series of pressure relief valves provides a wide scope of design in both pressure and temperature ranges. ASME B & PVC, Section VIII certified for vapor, liquid and steam applications meets most overpressure protection requirements of today’s industry. Check the tabs below for additional product information and option. Cast carbon steel body with stainless steel trim is standard. Special alloys are available for specific applications. The comprehensive line of spring loaded CONSOLIDATED safety relief valves represents over one hundred years of valve manufacturing experience in meeting and solving industry problems involving a wide scope of valve applications. 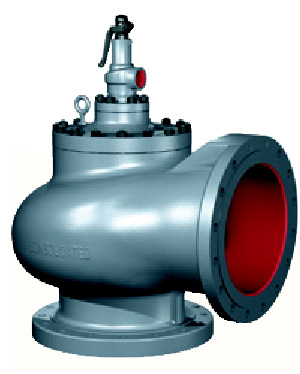 The flanged CONSOLIDATED safety relief valve line consists of valves in a variety of sizes and materials. Each product offering is unique and judgements are required in selecting the proper option. To accomplish the selection process start with the General Information section of this catalog and follow the prescribed steps necessary to finalize the selection. This Section, 1900 SRV, should be reviewed against the user’s specifications and product offerings selected. Beyond this step, proceed with sizing and then confirmation of the pressure and temperature limits (API or ASME). 1900 Flanged Series safety relief valves are supplied in many variations to suit specific applications. This standard rugged configuration is equipped with corrosion resistant trim and a carbon steel body, bonnet and cap. The components are top guided, providing for free and repeatable action. The flat disc seat provides for easy maintenance and remachining. The exclusive “Eductor Tube” minimizes bonnet cavity pressure so that product performance is predictable. The nozzle is bottom inserted and rigidly held in position, providing a corrosion resistant path of flow to the valve and corrosion resistant seating surfaces. Back pressure entering the valve through the valve outlet is excessive or variable. If back pressure fluctuates with ±10% of a nominal value, a bellows is required. If a built up back pressure exceeds 10% of the set pressure or cold differential set pressure, a bellows must be used. 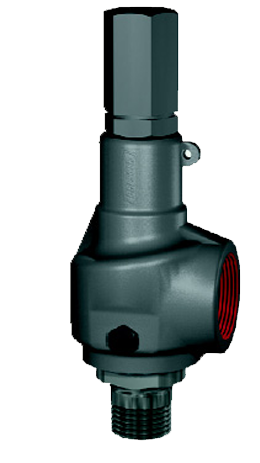 1900-30 Series valves are balanced bellows designs, meaning that they fully compensate for the effects of back pressure. back pressure (either constant or variable) exists and; excessive pressure may build in the bonnet as a result of pressure build-up in the bonnet vent piping and; resultant build-up of pressure in the bonnet would cause a dangerous condition. Caution: It is important that the bonnet be vented to the atmosphere. 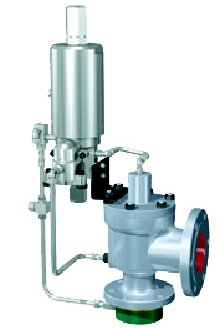 Safety relief valves specified within this catalog comply with API standard 526 – Fourth Edition, 1995. 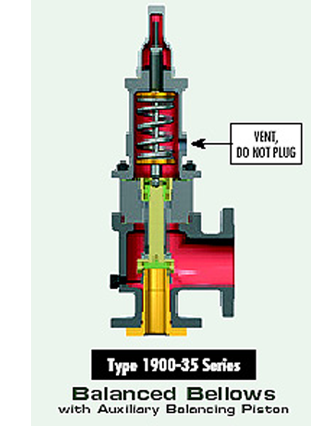 The 1900 Series valves previously complied with API standard 526 – Third Edition, 1984. In some cases dimensional and nominal flanges sizes differ between these two editions. When ordering replacement valves that must comply with API Standard 526 – Third Edition, 1984, contact the factory for verification of the correct replacement. Carbon Steel body with stainless steel is standard. valve for vapor and steam service opplications. Five sizes – .121 sq. in. to 1.399 sq. in. Stainless steel base with stainless steel trim is standard.